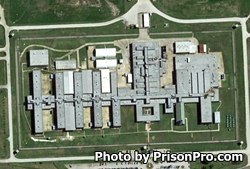 Ferguson Unit is a multi custody prison located in Midway Texas. The facility houses a maximum of 2,100 male offenders in the main unit and an additional 321 inmates in the Trusty Camp. Offenders range from G1 to G4 custody levels. Ferguson unit is comprised of two dormitories that can hold over 100 inmates each and over 935 single and double bunked cells. The facility is named after a former Governor of Texas James E. Ferguson. Ferguson Unit employs select inmates in a brook and mop factory, and in agricultural operations which include farming edible crops, managing bulls, and raising swine for consumption. Offenders are provided medical, dental, and mental health services on site. All inmates have literacy, adult basic education and GED courses available to them. Additional vocational training is provided in data processing, milling and cabinetmaking, welding, food services, and small engine repair. Substance abuse treatment, support groups and various religious worship services and studies are provided to offenders at Ferguson Unit. Visitation at Ferguson Unit is conducted on Saturdays and Sundays from 8am-5pm. Visits are two hours in duration and depending on the offenders classification and status can be either contact or non-contact. Visitors may bring a clear Ziploc bag with up to $20 in quarters to use in the visiting room vending machines.